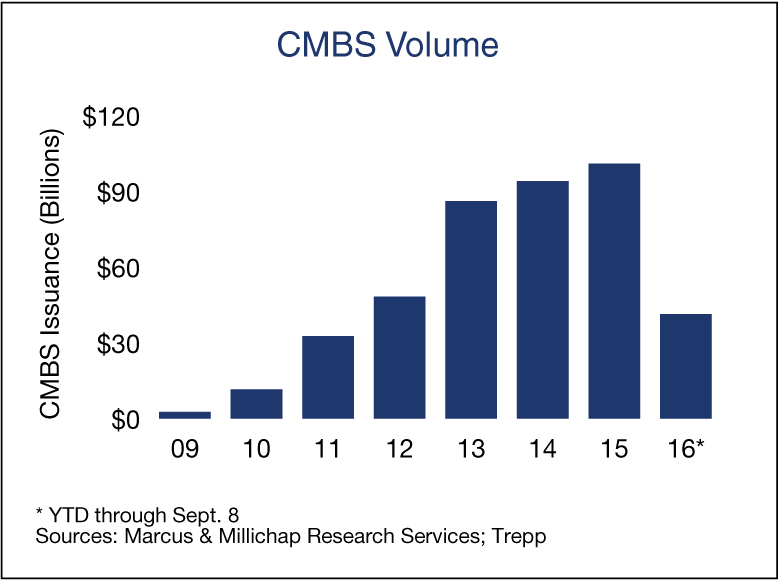 Commercial mortgage-backed security (CMBS) financing slowed dramatically in the first half of 2016 as volatility roiled the debt markets. In addition, new rules governing CMBS issuance that take effect at the end of this year also created uncertainty in the marketplace. However, the first CMBS offerings that comply with Dodd-Frank risk retention regulations were issued in the past month and received strong interest from bond investors. Now that the first risk-retention offerings have been completed, greater certainty in the mortgage bond market will once again make CMBS a viable financing option for commercial property owners and investors. The new risk-retention rules are part of the Dodd-Frank reforms and go into effect at the end of 2016. Under the regulations, CMBS bond issuers must keep 5 percent of the transaction’s value on their books for a minimum of five years, or have a B-piece bond investor purchase it. B-piece investors typically purchase the riskiest bonds in a CMBS offering, although their commitment is usually less than 3 percent of the total dollar value. The higher commitment threshold and longer holding period may require B-piece buyers to seek higher yields, placing upward pressure on borrowers’ costs. CMBS offerings that meet the new risk-retention rule came to market since early August. The deals were well received by mortgage bond investors and compressed spreads to some of the lowest points this year, implying a lower cost to borrowers. Currently, CMBS spreads are 235 basis points to 275 basis points above the 10-year U.S. Treasury swap, down from more than 300 basis points over during the second quarter. Although the recent offerings may yet be subject to further review by federal regulators, the initial response buoys the CMBS market that has seen only $41 billion in bonds issued this year. A Federal Reserve survey of lenders indicates that commercial real estate loan standards tightened in the second quarter. Debt providers are likely seeking to balance risk exposure to commercial real estate and take a more conservative lending approach while the current cycle matures, rather than expressing a bearish outlook on commercial property. Some of the greatest tightening occurred for construction loans, a trend that may potentially prevent some early-stage developments from advancing and ultimately minimize the upward pressure of new supply on vacancy rates. Declining vacancy rates and rising rents provide a rich environment for commercial real estate transactions. U.S. multifamily vacancy hit its lowest level in 10 years at 3.8 percent at midyear, but the rate will rise slightly by the end of 2016 as new supply outpaces demand. Rising space demand and muted construction are maintaining vacancy rates in the industrial, office and retail sectors at post-recession lows that bolster investor confidence and support an active and relatively vibrant debt market. This entry was written by marcusmillichap, posted on September 20, 2016 at 12:13 am, filed under Commercial Real Estate, Research and tagged CMBS, Economic Growth, Economy, Marcus and Millichap. Bookmark the permalink. Follow any comments here with the RSS feed for this post. Post a comment or leave a trackback: Trackback URL.